As of this morning the #MetLifeTakeover tickets are all sold out! We are talking to the Jets about trying to get a couple more rows in another section close by but we have already sold over 1000 tickets! Even if you don’t get tickets with us everyone is invited to both the tailgate and the pre-party at our bar Slattery’s Midtown Pub. We also partnered with the NFL Experience to get you guys discount tickets with to their Times Square attraction. Let’s start with the tailgate! The catered tailgate is being offered by Urban Tailgate up until game day, but our discount code only works until tomorrow night so this is your last chance to get the all you can eat and drink tailgate for $65. You can read more about it over on the #MetLifeTakeover FAQ and you can buy your tickets via Urban Tailgate here. 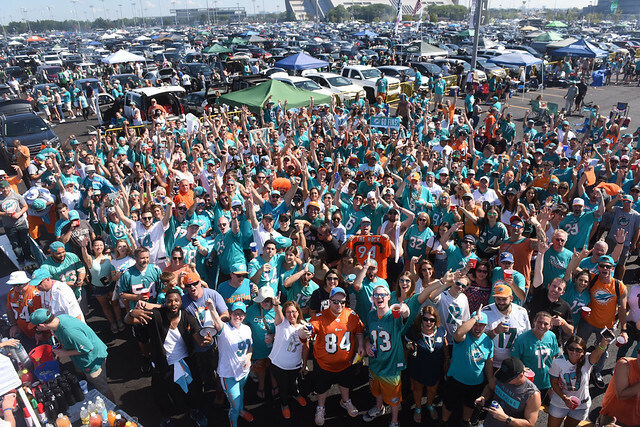 The $20 off coupon is “DOLFANSNYC2018” and if you get the cheaper no alcohol option you can still get $10 off using “FINSUP” as the coupon code. And as always you are more than welcome to enjoy the tailgate party with us for free. Just BYO if you want to eat or drink but come party with us. We have a ton of stuff going on including raffles, merch sales, a live taping of Joe Rose & Nat Moore’s “Cup of Joe” and a performance from Solo D.
Speaking of Solo D he is also going to be performing at our Pre-Party at Slattery’s Midtown Pub. The party is going to start early at 6pm so that we can end by 9pm so people can still get some sleep before the #MetLifeTakeover. Slattery’s is at 8 E. 36th St in Manhattan and is walkable from Penn Station, Times Square and a ton of other Subway stops. On top of the Solo D performance we will have merch for sale, raffles and maybe even a live auction if we get a good crowd. We also just redid our Dolfans NYC museum in the back of Slattery’s so make sure you check that out. A lot of work went into that space. Lastly I want to mention the NFL Experience promotion we are doing. The NFL Experience Times Square is a “football theme park” that features memorabilia, games, photo ops and much more. This article gives a pretty good run down of what you can expect if you visit. They call it “Disney meets the Hall of Fame meets Dave & Busters”. They reached out to us about doing something with us so we figured the #MetLifeTakeover weekend was a perfect opportunity since a bunch of people will be in town for the game. If you want to check it out we have discount tickets available on Friday and Saturday. It’s not too far away from Slattery’s so if you want to stop by before our event Saturday it should be the perfect pre-game to the pre-party. You can use the coupon code “DOLFANSNYC18” to get tickets for just $25 which normally run you $39. Should be a really fun weekend. Okay, so that’s it! See a lot of you at Slattery’s on Sunday for the first bit of real football in a long, long time! Phins up! 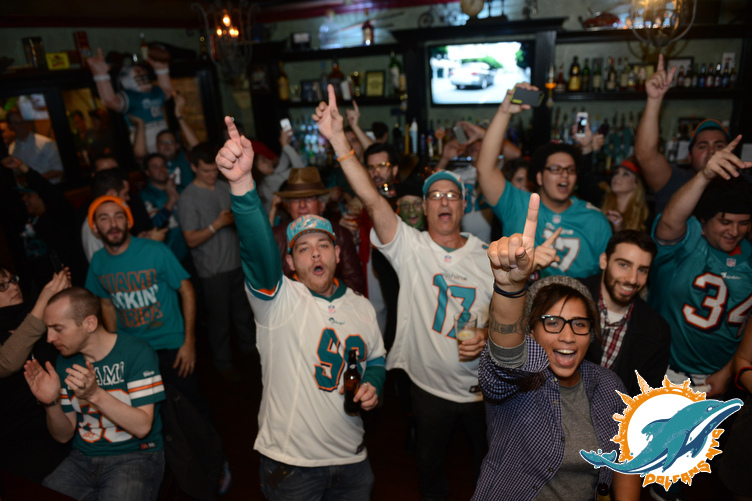 The season is coming to an end and Dolfans NYC has a bunch of merch and raffle prizes still left over. We decided we want to get rid of a bunch of stuff so that we don’t have store it during the off season. We figured a perfect solution would be the first annual Dolfans NYC yard sale! This is a perfect chance to get some last minute Christmas gifts for friends, family or yourself. We have a ton of old logo Dolphins stuff, random small items and some rare stuff like a Dolphins drink set that was given to VIPs by the Dolphins for Christmas a few years ago. 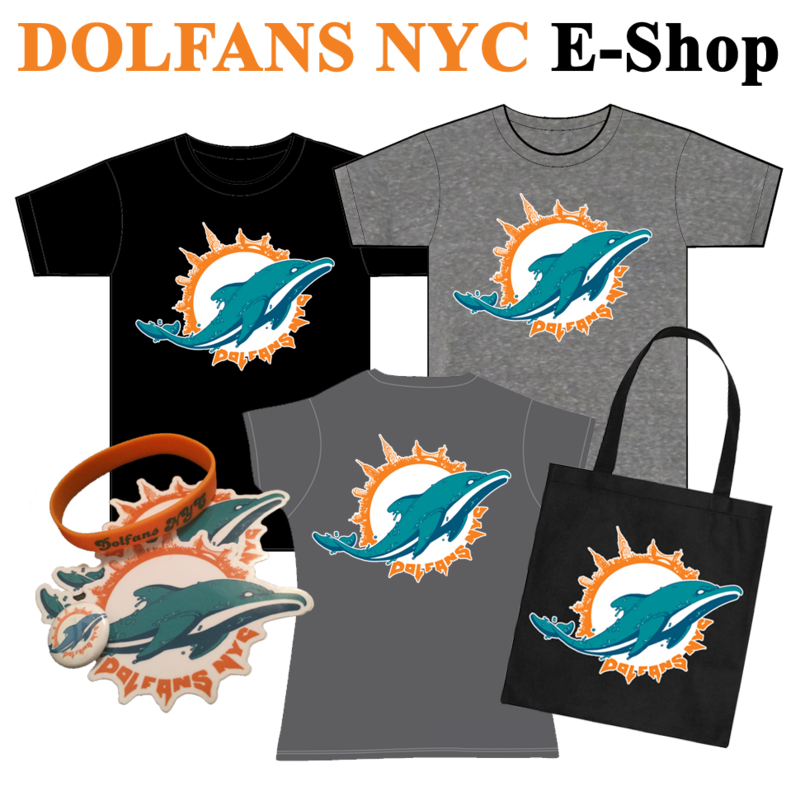 We also will be selling our standard Dolfans NYC gear but you will save $5 per $40’s you spend. So come to Slattery’s for the Vikings game and bring cash! We will be making donations to Toys 4 Tots, Ride DCC and several other charities this holiday season so help us make one final fundraising push! Speaking of fundraising, we donated $1000 to the Go Fund Me for Jamie Quadrozzi the Dolphins manager of promotions and brand impact. She helped throw the Dolphins fan club weekend and has been a long supporter of Dolfans NYC. She was injured badly in a car accident and if you can find it in you to donate some money this holiday season you should! Get better Jamie! Lastly, our #MetLifeTakeover wrap up video is behind schedule but should be here soon! Be on the look out and in the mean time check out Solo D’s new video which features footage from our takeover pre-party. Anyway, I will see you guys Sunday at Slattery’s. Phins up!